Check out this deal! 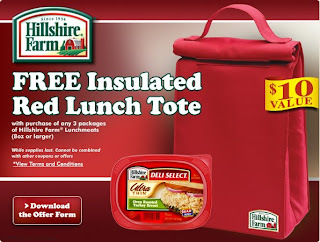 Go here to download an offer form and get more details on how you can get a free insulated red lunch tote from Hillshire Farm. You must purchase and send in the UPC's of 3 packages of Hillshire Farm lunchmeat with the orginal receipt.